Many people would be familiar with the three letters THC – which represent tetrahydrocannabinol, a psychoactive cannabinoid found in cannabis. In this article, we’ll look at what tetrahydrocannabinol is, how it works and its current and future role in medicine. 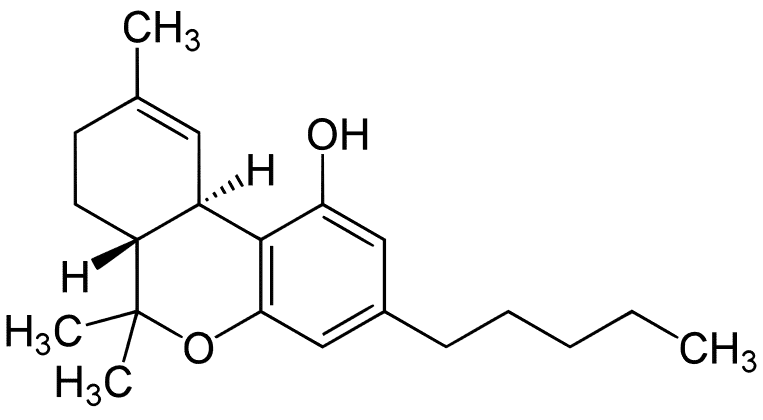 The above image shows THC’s molecular structure. The chemical formula for tetrahydrocannabinol is C21H30O2 . PLEASE NOTE: The following does not constitute professional medical advice, but is provided as general information. The human body has what is known as the endocannabinoid system, which regulates a number of important functions – physiological, mental and emotional. Our bodies have special receptors that respond to the endocannabinoids we create; which then trigger actions for maintaining good health. If the body isn’t producing enough of certain endocannaboids, health problems can occur. THC is quite similar to these endocannabinoids and can “plug in” to the receptors, filling the gap and restoring the balance. Why Does Cannabis Have Tetrahydrocannabinol? Some believe the cannabis plant evolved to create THC as a defense mechanism against herbivores; however, some animals don’t seem to be bothered by it and will in fact seek out cannabis. Another line of thought is that THC provides cannabis with some protection from UV rays. Does Industrial Hemp Have THC? Yes, but in small quantities – it’s one of the features that distinguishes it from marijuana, and it’s important to understand the difference between the two plants. While industrial hemp and marijuana are both members of the cannabis family; hemp is cannabis sativa L. subsp. sativa var. sativa, and marijuana (including medical cannabis) is sativa subsp. indica. What Is The THC Level Of Cannabis Grown For Medicinal Purposes? Some strains of medical cannabis are particularly potent, yielding up to 25% tetrahydrocannabinol. This is certainly not your grandparents’ marijuana; so it shouldn’t be treated as such. Dronabinol is a synthesized form of tetrahydrocannabinol used to treat nausea and vomiting resulting from chemotherapy. It is sold under the brand name Marinol. Tetrahydrocannabinolic acid (THCA) is present in fresh cannabis is a precursor to THC. THCA becomes THC after a drying process. THCA does not have an intoxicating effect and has been shown to have potential anti-inflammatory, neuroprotective, anti-emetic and some anti-cancer effects. What Conditions Can Tetrahydrocannabinol Treat? When THC is paired with another cannabinoid called CBD, it’s thought cannabis medicines can be even be more effective and with a much wider range of conditions. Research into tetrahydrocannabinol has certainly picked up in recent years, with many clinical trials currently underway. By combining THC with another cannabinoid called cannabidiol, the severity of side effects may be reduced. It’s also important to remember we’re discussing THC in this article, not the smoking of marijuana. Burning plant material comes with its own set of risks and effects. How Many People Have Died From THC Poisoning? To the best of our knowledge – zero. There is apparently no lethal or toxic amount of THC. According to the USA’s National Cancer Institute, because cannabinoid receptors are not located in the brainstem areas controlling respiration, lethal overdoses from cannabis and cannabinoids do not occur. However, the effects of THC intoxication have certainly led to instances of death through actions taken by people while under the influence of the compound. The lack of fatalities through overdose per se doesn’t necessarily mean THC is safe – different people react differently to any medication and this is why medical supervision is important. This is still very unclear as some studies have suggested it can trigger schizophrenia and other mental illnesses in those predisposed to them; others say it doesn’t – and any clarity on the issue is probably quite some way off. When used correctly and under medical supervision, addiction and withdrawal symptoms don’t appear to be a major risk. However, addiction and dependence isn’t unheard of, particularly when THC use becomes abuse – just the same as many other medications of this nature. Microdosing means taking a very small dose of THC, not enough to have any noticeable impairing psychotropic affect. It’s believed by some that microdosing THC can help address anxiety and foster creative thinking without impeding performance. What Is The Legal Status Of Tetrahydrocannabinol? It varies from country to country, but in most where it is legal there’s usually strict regulations – so before buying any THC based medicines, check with your local authorities. Just because something can be easily purchased over the internet, it doesn’t mean you won’t wind up in jail if you are caught with it. And it may not even be the most important one in medical applications. Cannabis contains many dozens of other cannabinoids other than THC; including cannabinol (CBN), cannabicyclol (CBL), cannabichromene (CBC) and cannabigerol (CBG). Probably the most important cannabinoid being investigated currently is cannabidiol (CBD), which unlike THC is non-intoxicating. Increasingly, THC is not being used on its own in medicines, but in combination with CBD. You can learn more about cannabidiol here. Some believe other cannabinoids in cannabis are important to use with THC and promote a “whole plant” approach to create what is referred to as the “entourage effect”.